Eating is a very personal thing. I don’t think it’s necessarily appropriate to tell others what to eat. Some people just have foods they can’t stand, get sick from and some they just really like and will eat no matter what. That’s ok. The following are just suggestions and ideas that maybe many people are not aware of or gave any thought of until now. And of course eating is not just an environmental issue – it’s a health issue. Personally, I believe that the health issues are more important, but that’s my opinion. “Overfishing occurs when fishing activities reduce fish stocks below an acceptable level. This can occur in any body of water from a pond to the oceans” (source). Tuna and salmon populations are of special concern. To find salmon from a sustainable source I recommend going to the Monterey Bay Aquarium site to this page – and scroll down to the section titled: “Where can I find sustainable sources for salmon?”. The bluefin tuna is commonly used in sushi and sashimi and due to its popularity is in danger of becoming extinct (Scientific American, March 2008, p.71). Some other tunas are also overfished, skipjack however is considered ok to eat (source) and is commonly found in canned tuna. More information about tuna can be found at the Bay Aquarium site – scroll down to the bottom of the page to: ‘Where can I find sustainable sources for tuna?’. Additional information about good and bad seafood choices can be found at the Environmental Defense Fund site. Eating less meat is considered by many to be better for the environment because it takes more land and water use to raise animals for food than to grow plant food for people to eat. For additional information see: Consequences of Increased Global Meat Consumption on the Global Environment — Trade in Virtual Water and Nutrients. A recent study in Environmental Science & Technology and reported by National Geographic shows that eating only locally grown foods does not have that much of an environmental impact. Instead what you are eating is likely to be more significant. All the transportation of food is only 11% of foods’ climate impact “compared with the impact from producing the food itself”. Beef production contributes a larger percent to warming from greenhouse gases. There is also some evidence to suggest that eating meat is not that healthy. For example in many groups of long lived people, they eat very little if any meat. That might seem surprising to many, but the use of biotechnology and genetically modified crops reduces the amount of herbicides and pesticides used and can allow no-till farming. When farm land is tilled it releases carbon from the soil and into the atmosphere, among other things. For millennia people have been breeding plants to increase or introduce the desirable traits they wanted. A well known example is that of teosinte. Teosinte is a wild grass that humans started cultivating over 6000 years ago. They selected for the traits they wanted and eventually teosinte developed into what today is called ‘corn’. Corn is ‘a human invention, a plant that does not exist naturally in the wild. It can only survive if planted and protected by humans’.(source). 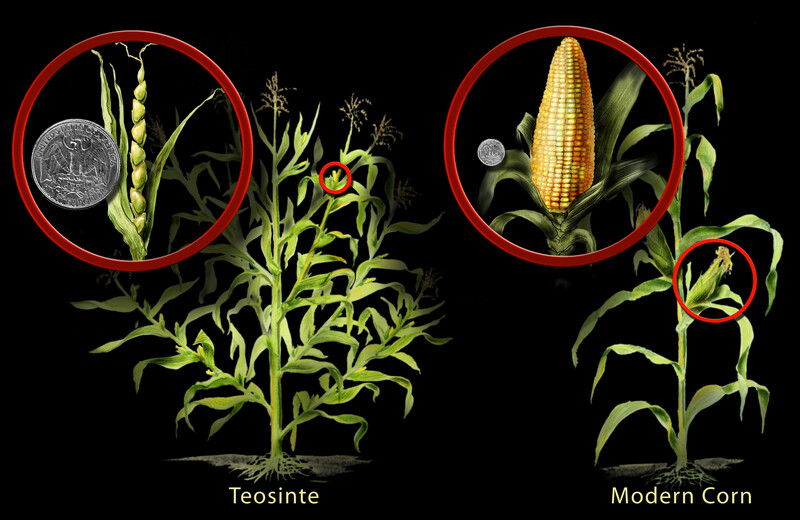 See some cool pictures of the original teosinte and modern corn from NSF.gov and Berkeley. In more recent times, since we now have the knowledge of genes and the proteins they express, we can modify our crops in a much more systematic way. With traditional breeding methods like that used in developing teosinte to corn, it wasn’t possible to know or control exactly which genes would be passed on in each round of breeding. Today, since we have a very good understanding of different genes, their proteins, etc. we can choose exactly which genes we want to be present in a plant. Subscribe to comments with RSS or TrackBack to 'Eat in a more environmentally sustainable, responsible and healthy manner'.